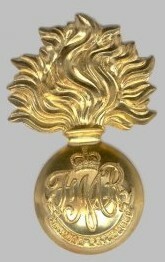 Approved for the 65th Carabiniers (Mont Royal). (G.O. 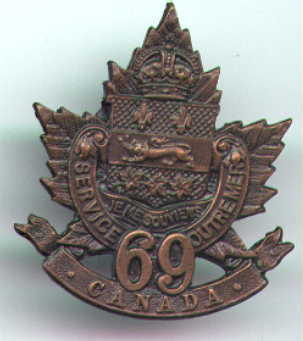 69 of 1919), subsequently superceded by approval for Les Carabiniers Mont-Royal. (G.O. 109 of 1929). Summer Operations, 1915. (March-October) Ypres, 1915 22 April – 25 May 1915 Perpetuates the 69th and 150th Battalions, Canadian Expeditionary Force. Les Carabiniers Mont-Royal - "Ypres, 1915, '17, Festubert, 1915, Somme, 1916, Arras, 1917, '18, Hill 70, Amiens, Hindenburg Line, Pursuit to Mons"
Les Fusiliers Mont-Royal - "Dieppe, BOURGUEBUS RIDGE, St Andre-sur-Orne, Verrieres Ridge - Tilly-la-Campagne, FALAISE, Falaise Road, The Laison, Foret de la Londe, Dunkirk, 1944, Antwerp - Turnhout Canal, THE SCHELDT, Woensdrecht, South Beveland, THE RHINELAND, The Hochwald, Xanten, THE RHINE, Groningen, Oldenburg, NORTH-WEST EUROPE, 1942,1944-45"